Waikiki Beach is one of the most iconic holiday destinations in Hawaii, not only because it is known as the 'gateway' to Hawaii, or because of spectacular Diamond Head, or because it's home to some of Hawaii's best surfing. 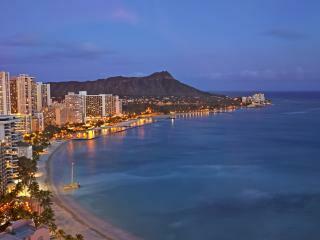 It's also because it's here you'll find some of the top holiday resorts on Waikiki Beach, Hawaii. 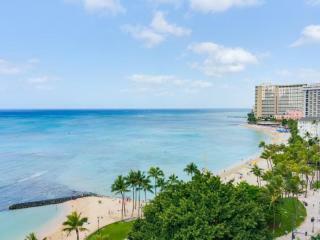 Set in an ideal location offering spectacular views and a wonderful beach atmosphere, these top holiday resorts on Waikiki Beach, Hawaii offer outstanding value for money when you compare accommodation and facilities against price. Situated right across the road from some of Hawaii's best shopping, this hotel features 1 and 2 bedroom spacious suites and apartments with access to excellent onsite facilities. Enjoy the convenience of self-catering accommodation and the luxury of full hotel services at this resort offering amazing ocean views from every room. Everything you need is within walking distance. Centrally located in Waikiki and boasting ocean views from private courtyards and balconies, this resort blends modern comfort with authentic island atmosphere for the ultimate Hawaii experience. 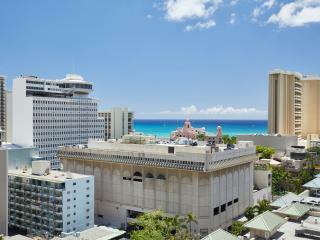 Within minutes of Honolulu's most popular shopping, dining, activities and attractions, this hotel offers beachfront accommodation with picturesque views of the mountains, ocean and city. This self-catering accommodation boasts convenient and location, just opposite the International Marketplace. Offering everything from simple guest rooms to 2 bedroom suites and excellent onsite facilities, this hotel is surprisingly affordable. 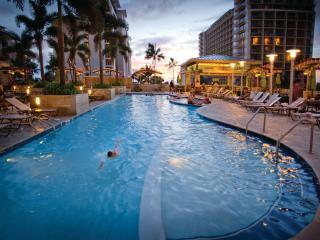 Although these are our top 5 resorts on Waikiki Beach, Hawaii there are many more to choose from. All offer an unbeatable location so it's up to you to decide your budget and the type of accommodation and facilities that will suit your needs.